SAVE WHEN BUYING TWO PAIR! This is a casual, dress weight alpaca sock that is comfortable next to your feet. Make our alpaca socks your everyday, go-to sock. Wear with casual or dress shoes very comfortably. Mid-calf height. Help wick moisture away from your skin. 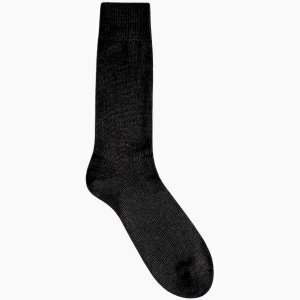 This alpaca sock offers natural "breathability", and an attractive, subdued appearance and is hypoallergenic. Available in three sizes fitting for men and women. Colors: Black, Navy, Silver-Grey and Brown. Composition: 42% Alpaca, 18% Wool, 26% Acrylic, 14% Nylon. or 50% Alpaca, 50% Acrylic.